According to a team of researchers, the most ancient solar observatory may have been located in the archeological site of Chankillo, Peru. The place, located in the coastal valley of Casma 320 km north of Lima, contains a group of structures approximately 2,300 years old, known as Las Trece Torres (The 13 Towers). According to a study published in the specialized magazine Science, the towers encompass the arch of annual sunrises and sunset. The authors of the Article, one being Professor Iván Ghezzi from the National Culture Institute of Peru, consider that the towers, which were discovered more than a century ago, may have been utilized to indicate special dates on a solar calendar. “It seems extraordinary to me that, in all this time, nobody has recognized what the towers were used for, “Professor Clive Ruggles from Leicester University, United Kingdom, told BBC. “I was stunned for the first time I saw them: the network of towers captures the complete solar arch,” he added. The towers are arranged from north to south on a small hill. 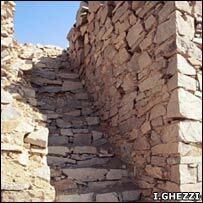 They are relatively well-preserved and each one has stairs that lead to the top. The rectangular structures, from 75 to 125 meters squared, are situated at regular distances from one another. Archeologists propose that there were two observation points, one to the east and the other to the west. “For example, if you stand on the Western observation point, you could see the sunrise, but the position where it exits along the length of the towers depends on the time of year,” explains Professor Ruggles. Ruggles pointed out that the observation points are very restricted and would not fit more than 2-3 observers at one time. “All evidence indicated that these towers had a formal or ceremonial objective and that in them special rituals were celebrated,” said the researcher. There are written facts that indicate that 800 years after the construction of these towers, the Incas carried out solar observations and worshipped a solar deity. “We know that, in the times of the Incas, the towers were utilized to observe the Sun during solstices, which allows us to speculate that there are indicative elements of practice of worship that date from much earlier,” said Ruggles.